Ceramic Tile Paint – Can paint change the color of your ceramic tile? To change the color of ceramic tile, paint or coatings can be applied. However, there is a lot of confusion over whether tiles should be painted, reglazed, or refinished. There are significant differences between these treatments and factors that should be considered. Ceramic Tile Paint - What is the best process for re-coloring ceramic tile? There is no specific type of ceramic tile paint. Different companies use different types of paint or coatings and they also use various application techniques. It is certainly possible to roll on or spray on latex, enamels, or epoxies. Unfortunately, on a glass-type surface like ceramic tile, traditional paints will not provide the look or durability of real tile. The best process for re-coloring ceramic tile involves properly cleaning and bonding a hi-tech acrylic coating to the original tile surface. This process is most often called refinishing, resurfacing, or reglazing. The best refinishing results are produced by professional refinishers. Refinishing produces the best looking and longest lasting results on tile! Ceramic Tile Paint – What should you consider before painting ceramic tile? Ceramic tile paint can be used on any tile, but take into account practical considerations such as exposure to moisture and the wear and tear the surface will be subjected to. 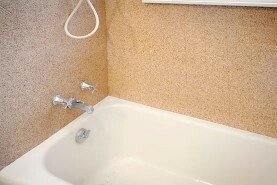 Ceramic tile in a shower or surrounding a bathtub that will be subjected to moisture should definitely be refinished. Ceramic tile on kitchen countertops, bathroom vanities, and floors should definitely be refinished. 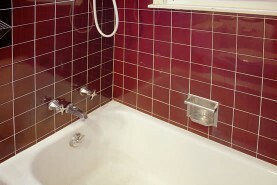 Tiles that are painted with simple enamels will not look as good as refinished tile. They will not last as long as refinished tile. And they will not feel like refinished tile. Ceramic Tile Paint – How do I find a professional tile refinisher? Instead of using ceramic tile paint, ask Miracle Method for a free refinishing estimate.Click on Find a Location, or call our toll free locator number, 1-888-271-7690, to reach your local Miracle Method representative.